Products We Love: Adam Brown's "Bright Spots & Landmines"
It's easy to get overwhelmed by all the how-to diabetes guidebooks out there. And oftentimes, while informative, these books do little to actually help us manage our diabetes on a daily basis. So when Adam Brown, diabetes life-hacker by way of his acclaimed DiaTribe column, Adam's Corner, sought out to write a diabetes guide, he made sure it wouldn't be just any old diabetes book. Instead, Adam came up with Bright Spots & Landmines, a brilliant, wonderfully interactive guidebook with insider tricks of the diabetes trade, meant for anyone, anywhere on their diabetes journey. There are SO many diabetes books out there. What's so great about this one? 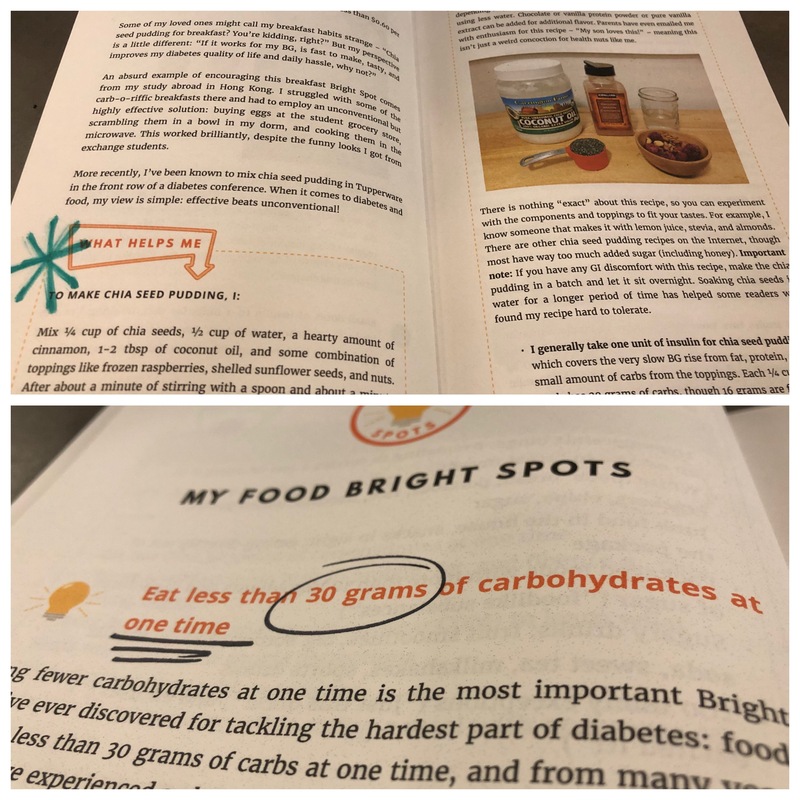 ● At the very beginning of this chapter, Adam bares it all in his first Food Bright Spot: “Eat less than 30 grams of carbohydrates at one time.” Now, this is something we can really get behind! We are all about going low-carb (It's Carbs, after all! ), so this is a message very near & dear to us at One Drop. ● Adam then does a major mic drop with this statement: “Eating fewer carbs is the single most important decision I’ve ever made for keeping my blood glucose in a tight range, taking insulin safely, reducing my diabetes burden and stress, and improving my quality of life and overall health.” ● With majorly awesome meal-plan examples (like cauliflower rice and, a personal favorite, a how-to-make-chia-seed-pudding play-by-play), grocery lists & real-life restaurant alternatives, Adam shows us how to score big with food bright spots. ● We can totally relate to the first and last landmines here, both of which (not surprisingly), are totally mental. Meaning? Easy to fix! ● First major landmine: an all-or-nothing approach to exercise. We are SO guilty of this one - that mindset of “it only counts if you're sweaty and exhausted.” Not the case! And as Adam points out, “five minutes of activity beats zero minutes.” Let that be your daily mantra. ● Second major landmine: focusing on the pain of exercise. Because let's face it. Working out is tough! But there are some very key ways to get past this, as Adam points out. Our favorite example of his? Smile. 😄 ● Also hugely helpful in this chapter are his exercise:blood ratio sugar tables. 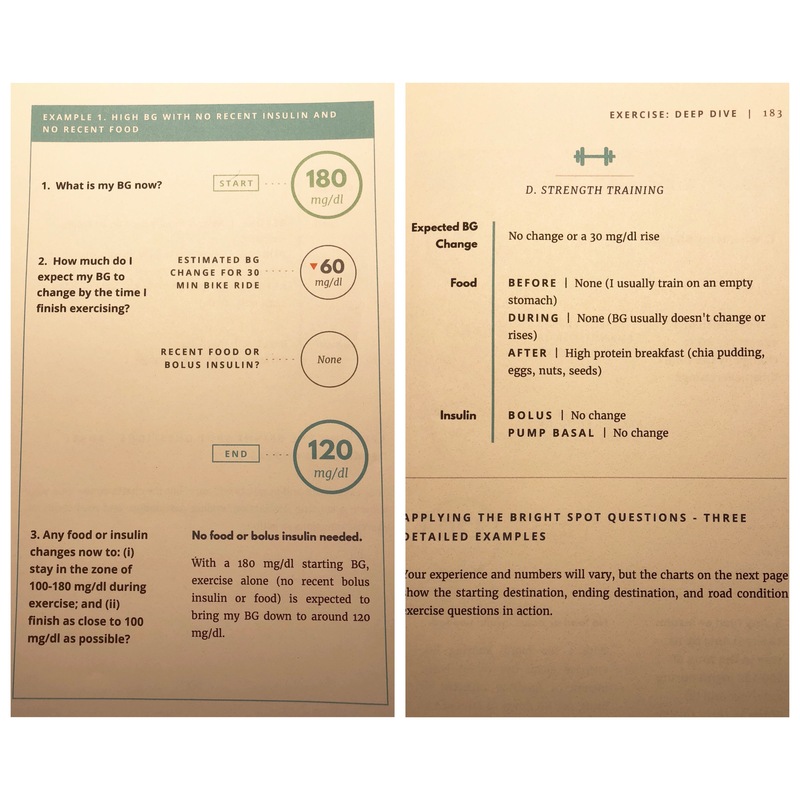 He breaks down specific workouts (walking, biking, strength training) into charts, detailing BG change, pre- and post-meal food intake and insulin basals and/or boluses. ● An all-time fave bright spot from this chapter: the importance of walking, especially after meals. Adam spends 4 pages explaining how and why walking is so important to diabetes, and we could not agree more. It's an underrated therapy, a hidden gem! And such an easy way to maintain BG levels. Sign me up! Where do I get one?! There are so many ways to get your hands on the ultimate diabetes guidebook! Grab a copy for yourself or a loved one in paperback or on Kindle. If you're more of a podcaster or would simply rather listen over audio, Adam's got you covered there, too. Get your audio version at Amazon, Audible, or iTunes, or listen to it for free via DiaTribe! All you have to do is push play. ▶️ And remember, there's always the free PDF! We like to have it on hand to print out our favorite pages & keep them posted around the house. Happy reads & listens!